iPhone Killer? Who Are You Kidding? After months of waiting, Nokia finally announced the N97, the company's second (unreleased) device to challenge the iPhone and revive to the N-series to their former glory. With a 3.5" touchscreen, 5-megapixel camera and 32GB of memory, the N97 is one phone worth waiting for in the New Year. Expected spring next year, the N97 features a kick-out QWERTY keyboard that is hidden behind the phone's 3.5" - 16:9 aspect ratio - touchscreen. As a worthy iPhone competitor, the N97 rocks a 5-megapixel camera on the back with Carl Zeiss Tessar lens and dual LED flash. Also, unlike the iPhone or the T-Mobile G1, the N97 can capture video in DVD quality in 16:9 aspect ratio. Storage-wise, the N97 does very well also. The phone comes with 32GB of on-board memory - that is twice the amount of memory the most expensive iPhone brings. As an extra, the capacity can be extended with microSD cards of up to 16GB, ranking up to a potential 48GB of storage on the N97. Priced at around $700 before carrier subsidies (simfree), the N97 is a 3G phone that can also do HSDPA speeds of 7.2Mb/s (obviously, if your carrier can handle it) and Wi-Fi. The usual flavor of A-GPS with an electronic compass is present, and if you plan to keep yourself entertained with this phone, Nokia says that the N97 can deliver up to 37 hours of music and 4.5 hours of video playback. Now, even with all these high specs, a good mobile phone would be nothing without software - and Nokia seems to deliver a good offering in this category. 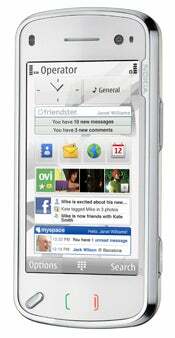 The N97 runs on Symbian S50 5th Edition and brings the familiar interface from the (yet unreleased) 5800 Express Music, previously known as 'Tube'. What's new from Nokia in the software side of things is the ability of having home screen widgets on the N97. Nokia says that these widgets will enable you to update social networks automatically with your status and location as well as related pictures or video. Nokia will also start competing with Apple's MobileMe service by launching new features for Ovi - the company's social portal. N97 users will be able to have their own free Ovi email account and will be able to enjoy push-like email as well as calendar and contacts synchronizing - T-Mobile G1 style. Check out this video Nokia released if you want to get a taste of how the software on the N97 will work.